National pressure brought to bear upon UG on DA’s conviction integrity unit issue – Welcome to Wyandotte Daily! More than 50 prosecutors and police chiefs on Wednesday sent a letter to the Unified Government Commission supporting Wyandotte County District Attorney Mark Dupree’s conviction integrity unit (CIU). The letter “reflects the view of law enforcement leaders and current and former DAs and AGs around the country that CIUs are an established practice, and are fully consistent with the obligations of DAs to seek justice and avoid the miscarriage of justice,” said Miriam Aroni Krinsky, executive director, Fair and Just Prosecution. Krinsky said a conviction integrity unit is consistent with DA Dupree’s obligations, and is one of the most important elements of what a DA does. Unfortunately, the position of local law enforcement leaders has resulted in the money for the program being held for now, and Fair and Just Prosecution hopes the UG Commission will agree to release the monies quickly, Krinsky said. DAs and state attorneys who signed the letter came from all over the nation, including Houston, Chicago, New York, Ohio and California. Also signing the letter were police chiefs in Arizona, Louisiana and Massachusetts. Dupree has proposed a conviction integrity unit that would review selected cases, with the help of law students working under their professors. If they believed a case should be re-examined, after reviewing it they would forward it to Dupree’s office for more review. Out of hundreds of requests, there are about 19 cases that Dupree believes should be reviewed. 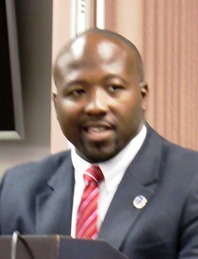 During a recent UG budget meeting however, officials learned that Kansas City, Kansas, Police Chief Terry Zeigler and Wyandotte County Sheriff Don Ash submitted a letter to the Kansas attorney general requesting a review of this CIU program, as well as an independent review of any case that proceeds through the CIU process. That letter also was signed by leaders of the Fraternal Order of Police. The UG Commission approved the funding for the CIU program on Aug. 2, but said they would hold the funds in a special account and wait for a response from the attorney general. The actual wording of their resolution, however, said that the funding could be released to the DA’s CIU program whenever the UG Commission approves it, not dependent on the attorney general’s response. Dupree has issued a statement saying that the attorney general has said local county cases are not in his jurisdiction to review. During the past year, a case that received much attention involved a man from Kansas City, Kansas, who was exonerated after spending more than 20 years in prison. Dupree believes there may be other cases like his. The letter sent on Wednesday was coordinated by Fair and Just Prosecution, a group of prosecutors and officials who support efforts to re-examine cases where there is a possibility of miscarriage of justice. “During budget planning, the Unified Government Board of Commissioners agreed to fund in 2018 and 2019, the Conviction Integrity Unit requested by District Attorney Mark Dupree. As envisioned by the district attorney, the CIU would review credible and verifiable claims of innocence, prosecutorial misconduct, ineffective assistance of counsel and law enforcement error. Dupree has identified 19 cases for review. “The Unified Government recently learned KCK Police Chief Terry Zeigler, Wyandotte County Sheriff Don Ash and the presidents of two local Fraternal of Police Lodges raised concerns about the Conviction Integrity Unit and requested Kansas Attorney General Derek Schmidt conduct an independent review and retain oversight of the work conducted by the CIU. “In light of this development, the Unified Government Commission decided to set the designated funding in a special account and not activate the CIU until the attorney general has the opportunity to review the proposal and the concerns expressed by law enforcement. The UG meeting where this issue was last discussed is on YouTube at https://www.youtube.com/watch?v=yydcLxwyjIo.